Elegant Mediterranean architecture nestles amidst a lush landscape and meandering lagoons. Just a short drive from the city centre sits one of the ultimate Shanghai luxury hotels in a setting that eases guests into tranquility. 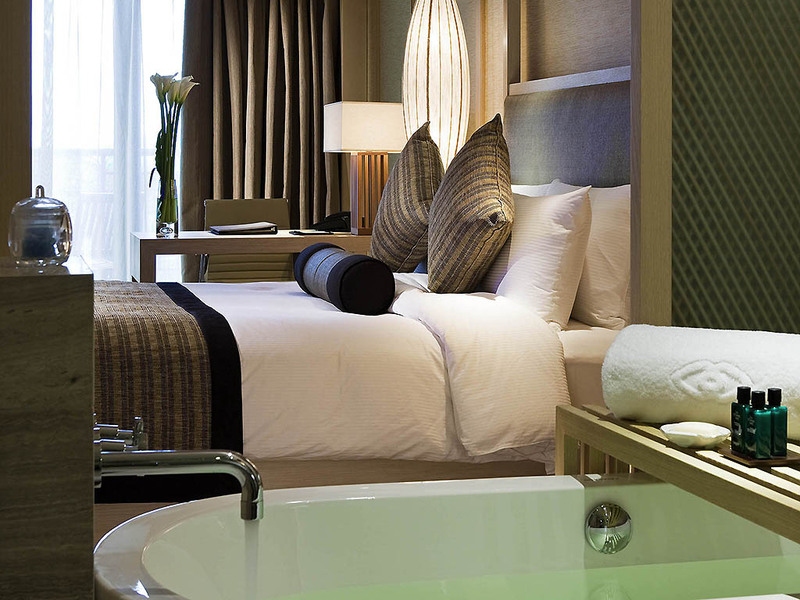 An international hotel that blends French hospitality standards with Chinese influences Sofitel Shanghai Sheshan Oriental accommodates business and leisure travellers in 368 luxurious rooms and suites as well as 7 opulent three- to five-bedroom villas. Magnifique meeting rooms and creative outdoor spaces offer exceptional venues for events. All your communication needs are met here, with business services for a stress-free stay. You are transported to the Mediterranean coast, with palm trees, lagoons and a sandy beach. Each Sofitel is a unique blend of the French art de vivre and local refinement. Charming and harmonious, Sofitel Shanghai Sheshan Oriental entices with a rich combination of Côte d'Azur sophistication and traditional fengshui attention to details. Drift away in the spa and let yourself be soothed in a nourishing cocoon, reveling in the harmonious tranquility and welcoming respite of a sensuous massage. Glide serenely through the blissfully warm waters of the divine indoor swimming pool. Your little ones are thrilled as a miniature train gently chugs them around the hotel. They discover new delights all around them - Kids Club, playgrounds, sandpainting, fun classes, a delightful beach, waterslide and their own special swimming pool. Parents and kids can immerse themselves in the supreme comfort of a sleek family suite, or a refined Mediterranean villa with its own private pool. Admire the alluring vista from your balcony and relish your sanctuary equipped with the latest technology. In Shanghai, architecture is a statement, from the prestigious buildings of the Bund to the soaring skyscrapers of Pudong. The city also boasts trendy boutiques and amazing museums, all adding to the unique charm of this pearl of the Orient. From Pudong International Airport, take the Expressway S1 to the Expressway S20, then the Hu-Yu Expressway G50 towards Qingpu District, take the Zhaoxiang exit and turn left to Jiasong South Road, the hotel is located on the corner of Sichen Road. 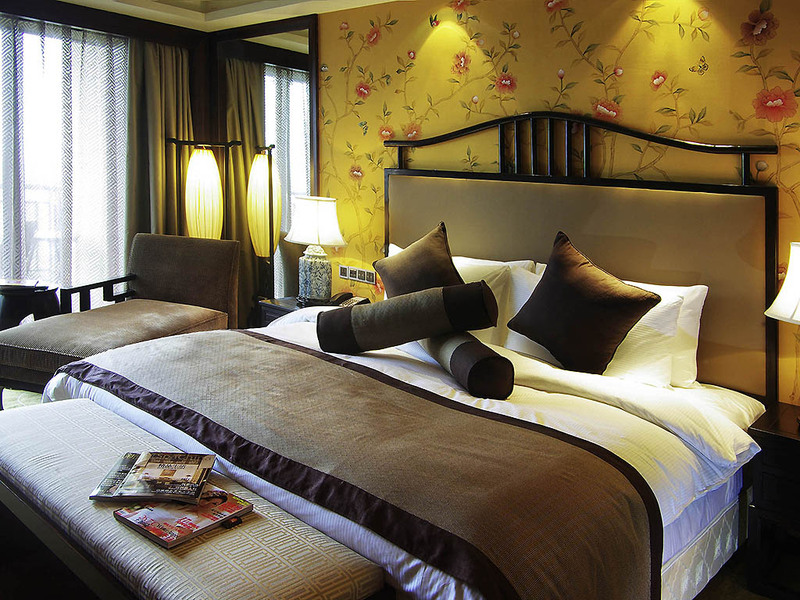 From Hongqiao Airport, take the Hu-Yu Expressway G50 towards Qingpu District, take the Zhaoxiang exit and turn left into Jiasong South Road, the hotel is located on the corner of Sichen Road. the corner of Sichen Road. The hotel offers 368 rooms including 53 Luxury Suites and 7 exclusive Villas. The rooms are inspired by three decor styles: Mediterranean, Chinese and Southeast Asian, and all have private balconies. 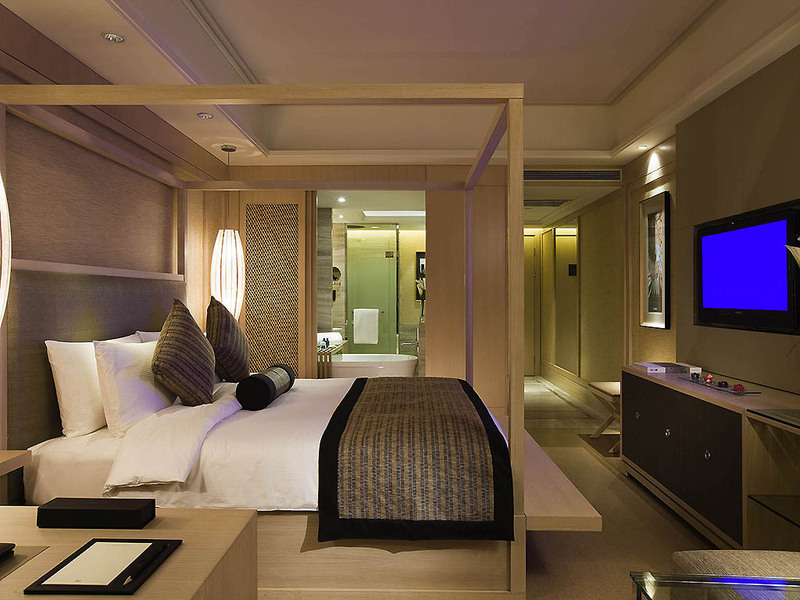 Mediterranean villas and indulgent suites offer Shanghais most tranquil accommodation. Breeze through spacious living areas private balconies and baths with luxury amenities. Villas feature 3-5 bedrooms - making them ideal family accommodation. 45 sqm/484 sqf, Private Balcony, Sofitel MYBEDTM, Flat screen LCD TV, Pillow Menu, Separate Bath and Rain Shower, Free high-speed Internet Access. King Room with Direct Access to the Pool, 45 sqm/484 sqf, Private Balcony, Sofitel MYBED, Flat screen LCD TV, Pillow Menu, Separate Bath and Rain Shower, Free broadband Internet Access. King or Twin Room with Direct Access to the Pool, 45 sqm/484 sqf, Private Balcony, Sofitel MYBED, Flat screen LCD TV, Pillow Menu, Separate Bath and Rain Shower, Free broadband Internet Access. 45 m²/484 sq.ft., Private Balcony, Sofitel MyBed, Pillow Menu, Separate Bath and Rain Shower, Lanvin bathroom amenities, Free high-speed Internet access, Club Millesime Lounge access with Breakfast and Happy Hour. 128 m² / 1377 sq.ft, separate living room, two private balconies, Sofitel MYBEDTM, Pillow menu, three flat-screen LCD TVs, separate bath and rain shower, Hermès amenities, free high-speed Internet, Club "Millesime" access with breakfast and happy hour. 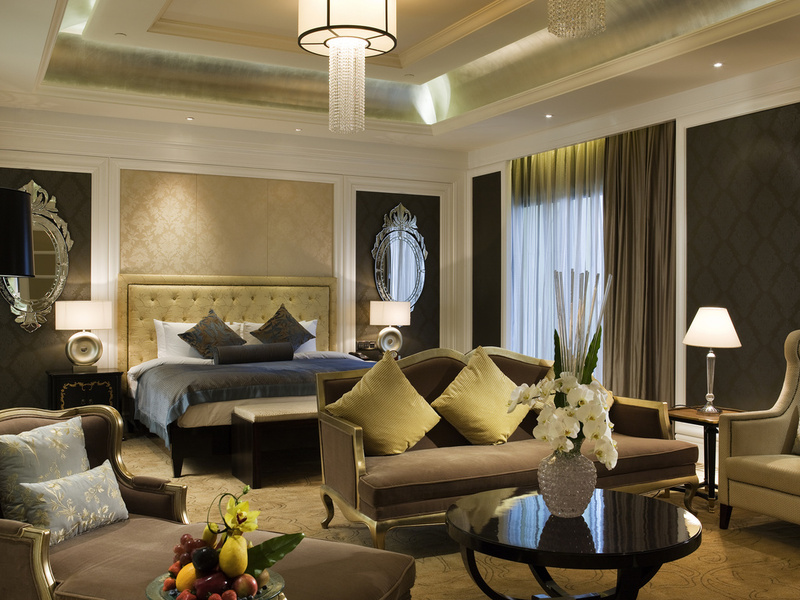 Club Millesime Lounge serves as an exclusive retreat for guests in our 5-star Shanghai hotels top accommodation: suites villas and club floor rooms. The stunning lounge is located in a quiet setting on the hotels fifth floor. Discover warm personalised service complimentary tastings from the wine showcase with individualized recommendations by the Sommelier private breakfasts coffee tea and soft drinks served throughout the day and countless VIP privileges. Seafood overlooking tranquil lagoons. Mediterranean cuisine in a luxurious setting. Cantonese delicacies in at the Chinese restaurant. Organic Japanese with sake. Savour 4 exquisite dining experiences by Sofitel Shanghai Sheshan Orientals talented chefs. High ceilings illuminated lanterns sophisticated design lagoon views and stunning cocktails soothe the spirit in one of Shanghais best lounge bars. Cognacs await at the cigar bar. Sip chilled drinks poolside. Find wellbeing at the health bar. Be enticed by fresh seafood and beef, served with fine sake, at Fukami Japanese restaurant. Sip a bespoke cocktail or celebrate with Champagne at the sophisticated Link Lounge Bar. With cooking stations staffed by master chefs, Vie breathes life into international cuisine. This impressive bar features exotic and trendy cocktails, rich selection of champagnes, wines, coffee and tea, surrounded by beautiful and soothing view of lagoons, creating a reflecting mood linking with life, beauty and nature. Chic and smart, yet relaxed and comfortable, Bar BLUE provides a selection of draft beers and premium wines by the glass in the evening, with a contemporary soundtrack to complete the scene. Poolside bar offers all day refreshments. Health Bar offers healthy drinks, light meals and spectacular lagoon view. 2,100 sqm of meeting and function facilities with 12 function rooms, the ballroom caters up to 1200 guests, this is an ideal and exclusive Shanghai meeting venue. Sofitel Shanghai Sheshan Oriental is an ideal event hotel taking advantage of an inspirational setting and complementing it with 2500 sqm of meeting and function facilities. Event venues include 14 meeting rooms a ballroom catering for up to 1200 guests and a variety of creative outdoor spaces. Inspired Meeting Planners assist in making each event extraordinary. Sparkling lagoons and elegant Mediterranean architecture serve as the picturesque backdrop to your wedding. Celebrate your day in one of the most peaceful Shanghai wedding venues in signature Sofitel style. Fresh Mediterranean delights savoured al fresco? A wedding banquet of exquisitely prepared Chinese cuisine? French champagnes and exclusive shoju? Sculpt a menu catered to your desires. Dine in an unparalleled setting, tailored to your dreams. Sofitel Shanghai Sheshan Oriental's InspiredWedding Planner leads you by the hand in creating a magnifique wedding - then manages all of the details so that you can devote yourself to the enjoying the romance of your special day. Mediterranean villas, suites and luxury rooms welcome bridal couples and their cherished wedding guests with a warm embrace. 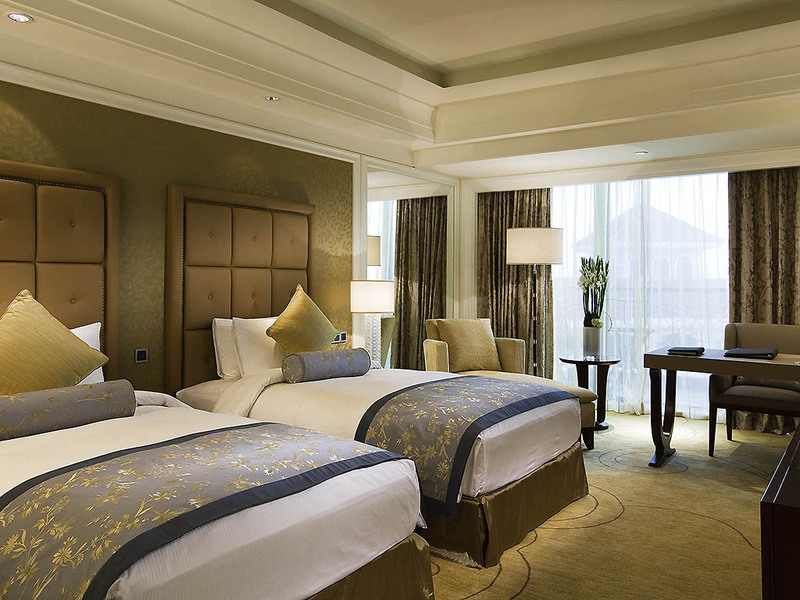 Sofitel Shanghai Sheshan Oriental boasts 378 rooms and suites, all with serene views, as well as 7 three- to five-bedroom villas. Banquet alongside the shimmer of the lagoon or beneath the glistening chandeliers of the ballroom. Sofitel Shanghai Sheshan Oriental offers a wide range of wedding venues. Host a series of spectacular events in venue of your choice. 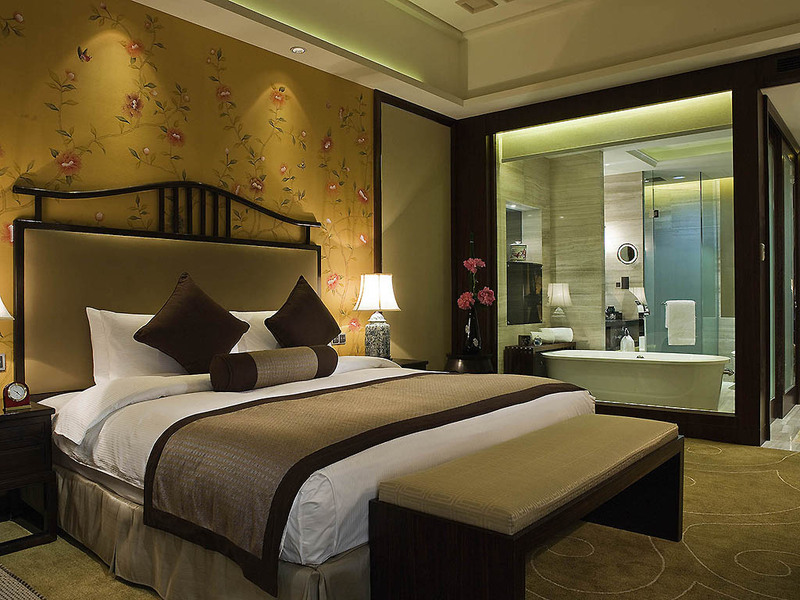 Sofitel Shanghai Sheshan Oriental is located in Sheshan National Tourist Resort in Songjiang District. Wedding guests will find the hotel conveniently located 35 min from the city centre, 20 min from Hongqiao Airport and 50 min from Pudong Airport. Start your married life in a most auspicious way - by being conveyed to the sumptuous hotel in the comfort and elegance of a Rolls-Royce limousine. Your palatial villa, with its private pool, ensconces you and your loved one in romance and enchantment. Work out in the well-equipped facilities of So FIT working up your heart rate on the cardio equipment or toning muscles with strength training. Alternately enjoy the fresh air on the outdoor tennis court or jogging track. Savour leisurely days in Shanghais premier resort hotel. Go for a day at the beach on the imported sands at the beach area of the hotels 4400 sqm of swimming pools. Explore the resorts natural surrounds or enjoy a round at the adjacent golf course. What better way to enjoy your sojourn in cosmopolitan Shanghai than by being chauffeured in an iconic Bentley or Rolls-Royce Ghost. Whether going to the airport or sightseeing with business associates, contact the concierge to arrange limousine service. The choice is yours. Take a refreshing dip in the pristine indoor pool, lined with gleaming blue tiles and illuminated by daylight. Or revel in the immense lagoon pool outside, graced with pavilions and peninsulas, and ringed by soft imported sand. In addition to the health club guests enjoy exercise in the most impressive Shanghai hotel swimming pools - 4400 sqm of outdoor swimming pools flow through the resort with one expansive pool area featuring its own pristine man-made beach.